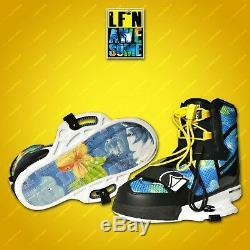 Liquid Force Next LF'N LTD Wakeboard Binding 12-13+. The next big thing to come from Bob Soven is his first closed toe pro model binding, the NEXT! His binding combines a lightweight, clean and smooth flexing Uni-body upper and our integrated Comfort Liner. The NEXT has an amazing fit with a dual zone lacing system and a unique front toe strap that gives you that locked to your board feeling. The NEXT gives Bob the confidence to carve bigger wakes, hit bigger kickers and land with complete locked down control. Sizes: 12-13+ USA; 45.5-46.5 EUR; 11.5-12.5 UK. 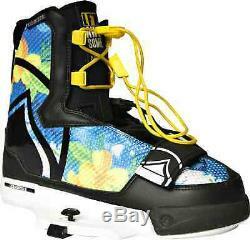 The item "Liquid Force Next LF'N LTD Wakeboard Binding 12-13+" is in sale since Thursday, December 13, 2018.